As the tilt of the Earth’s axis changes throughout the year and the northern hemisphere begins to point toward the Sun, the oceans above the equator start to get warmer together with the atmosphere. By spring this warming of the ocean-atmosphere environment generates cells of disturbed weather over the Indian ocean that are pushed over equatorial Africa by easterly winds. The interaction of these cells with the moisture-laden and very warm environment over equatorial Africa in turn generates rain, thunderstorms and even larger cells as the atmosphere and the ground interact with each other. As this process is repeated tropical waves are generated every few days, which continue to move toward the west along a corridor that becomes a tropical wave assembly line. Like pulses these tropical waves some of which grow to be quite large, perhaps 500 – 700 miles in diameter, march toward Africas’s west coast and the warming waters of the eastern Atlantic to the south of the Cape Verde Islands. Once these waves emerge over the Atlantic prevailing winds steer them westward along hurricane alley, where numerous factors including what is happening in the eastern Pacific waters off the coast of Peru, and other Pacific atmospheric cycles, as well as the coriolis effect from the earth’s rotation, influence the route these tropical waves take and their potential conversion to tropical cyclones. Over the last couple of weeks both the tropical wave assembly line and hurricane alley appear to have become more active and dynamic as the tropical waves being generated are larger, better organized and stronger. On 19 August 2010 Hurricane Alley was loaded with tropical waves that had congealed into a huge area of disturbed weather, generating rain and thunderstorms, which was more than 2000 miles long, while the assembly line over equatorial Africa appeared to generate more intense and closely spaced tropical waves. GOES color-enhanced infrared view of the Gulf, Caribbean and Atlantic basin. Visible to the right of the picture is the western extreme of a 2000+ mile-long area of tropical waves and storm cells that extends all the way to the coast of equatorial Africa. Another tropical wave is off the eastern coast of NIcaragua. Full-disk satellite view of Earth's western hemisphere showing the 'belt' of tropical waves, which includes hurricane alley and the assembly line over equatorial Africa, ringing our planet just above the equator on 20 August 2010. Historically the most active phase of the Atlantic annual hurricane season takes place from mid-August to mid-October reaching its peak in September. Satellite data and other observations appear to indicate the coupled ocean-atmosphere environment is already sending signals of becoming more active. Of interest to nations in the Caribbean, Central America, Mexico and USA interests along the Gulf, in Florida and the Atlantic seaboard, is the fact that the La Nina event, signified by the cooling waters of the eastern Pacific off the coast of Peru, is continuing and appears to be getting stronger. Historically La Nina has contributed to a favorable environment for the generation of hurricanes in hurricane alley. 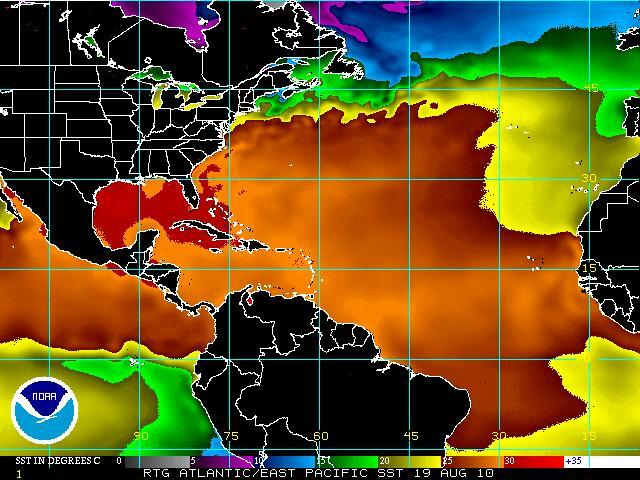 Map showing sea surface temperatures along hurricane alley, the Caribbean, the Gulf, and the eastern Pacific, as measured by remote sensing instruments onboard satellites on 19 August 2010. The green and ble colors off the coast of Peru indicate the presence of a devloping La NIna event. 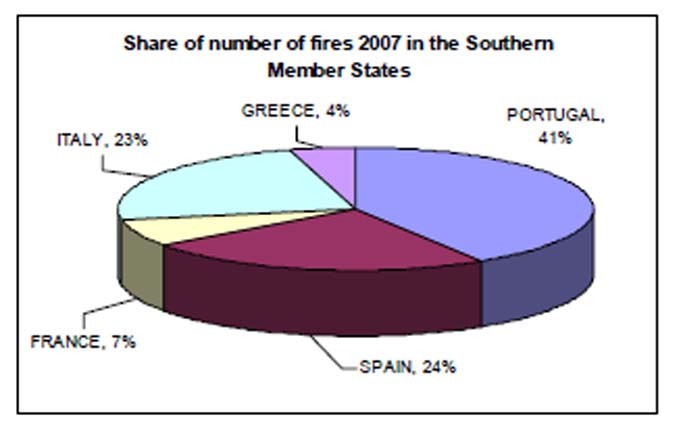 Historically the five southern European countries, France, Greece, Italy, Portugal and Spain, have had a higher annual incidence of forest fires than the rest of Europe. 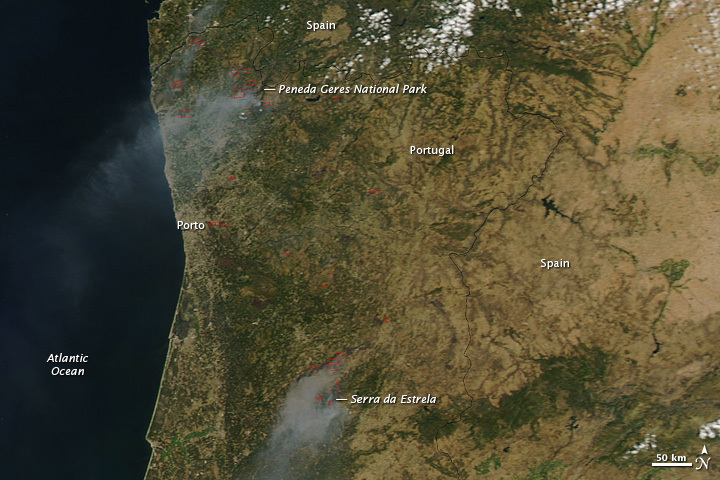 Among these five countries Portugal has been the most affected by forest fire events over the past several years. Currently there are several large forest fires in mountainous regions throughout Portugal and also in the Portuguese island of Madeira, which earlier this year suffered severe flooding. Both forest fires and flooding events are driven by weather and climate variability affecting Portugal and the larger Mediterranean basin. National authorities in Portugal led by the National Authority for Civil protection (ANPC) and the Directorate General of Forest Resources, with support from universities, such as University of Coimbra, and other public agencies have instituted a vigorous program of research, awareness and education, and fire management and control, which has proven successful in reducing the number and size of fire events in recent years and in raising the level of awareness among the general population including children. Climatic regimes have led to a fire season in Portugal that historically is most active from August through November, so the current forest fires mark what could be termed as the ‘start’ of the 2010 forest fire season. Some sectors, mainly academic research sectors, argue that urbanization and deforestation especially in recent years have exacerbated Portugal’s vulnerability to forest fires. 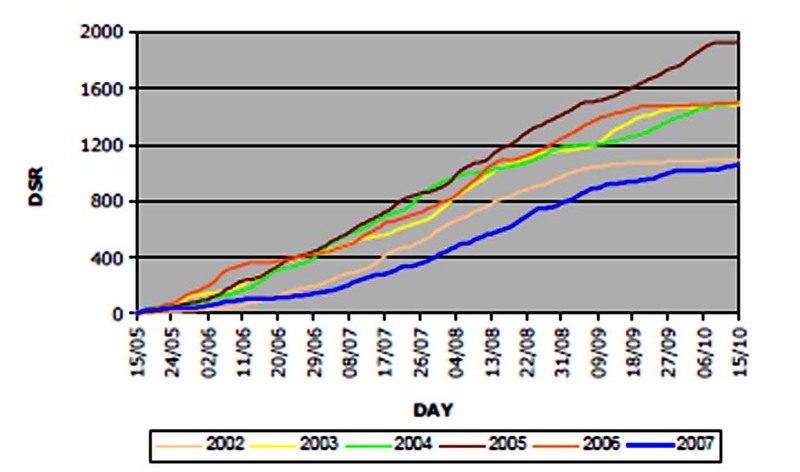 It is clear that the influence of such external drivers, as deforestation and urbanization, at a time when the annual fire weather index and the resulting daily severity index (DSR) appear to be increasing, certainly merit careful attention and more research focusing on causality with the objective of identifying effective mitigation measures to reduce the potential for damage from such hazard over recurring annual fire seasons.